"Devoid of the normal leadership philosophy B.S., One Piece of Paper is a simple yet profound guide for defining who you are and what you want to be as a leader. Read this book and write your own leadership maxims-it will make you a better leader and it may change your life!" "One Piece of Paper elegantly tackles the complex topic of leadership and makes it real, practical, and powerful for leaders in all walks of life. Leadership is about relationships. The approach explained in this book will help you build a strong foundation for the relationships you have with your team." 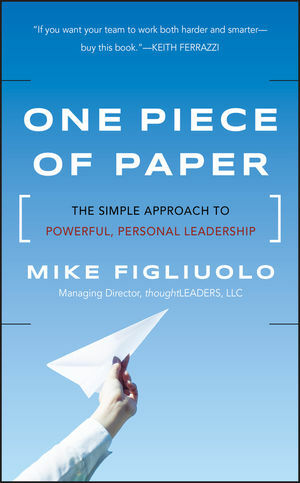 "In One Piece of Paper, Mike Figliuolo brushes aside the buzzwords and offers a clear path to becoming a truly authentic leader. If you want your team to work both harder and smarter—not just because you're the boss, but because you're a trusted ally—buy this book." "Because Mike Figliuolo is a leader himself, he truly understands the challenges leaders face in the real business world. His guidance and advice are practical, and in One Piece of Paper he zeroes in on the skills leaders need to compete effectively in today's global environment." "With professional ease, Mike joins with his reader through the building of leadership maxims, with a promise of collection into ‘one piece of paper’ at the end. The book feels like a conversation between two old friends, one of them being you." "With his unique insights from decades of experience as a combat arms officer, management consultant, Fortune 500 executive, and entrepreneur, Mike Figliuolo has hit the mark with a must-read for leaders at all levels who want to radically improve their effectiveness." "Once I began it, I could not put Mike's book down as I learned how to learn about myself. Beginning with establishing an honest, personal introspective foundation, One Piece of Paper provides a hands-on, actionable guide to credible, effective leadership." —Jack Partridge, president, Columbia Gas of Ohio, Inc.
"Dynamic leaders at all levels will benefit from Mike Figliuolo's experience and powerful approach. If you are ready to take ownership of defining your authentic style of leadership, then One Piece of Paper is the place to begin." "One Piece of Paper is exceptionally framed, forward-thinking, and thought provoking. Mike Figliuolo provides key leadership insights and perspectives that are real. This book represents concise, practical, and effective thinking on leadership, and plainly said, this approach works." "Mike Figliuolo's maxims approach to leadership provides a simple yet profound template for developing the kind of synergy, trust, and confidence essential for successful organizations."